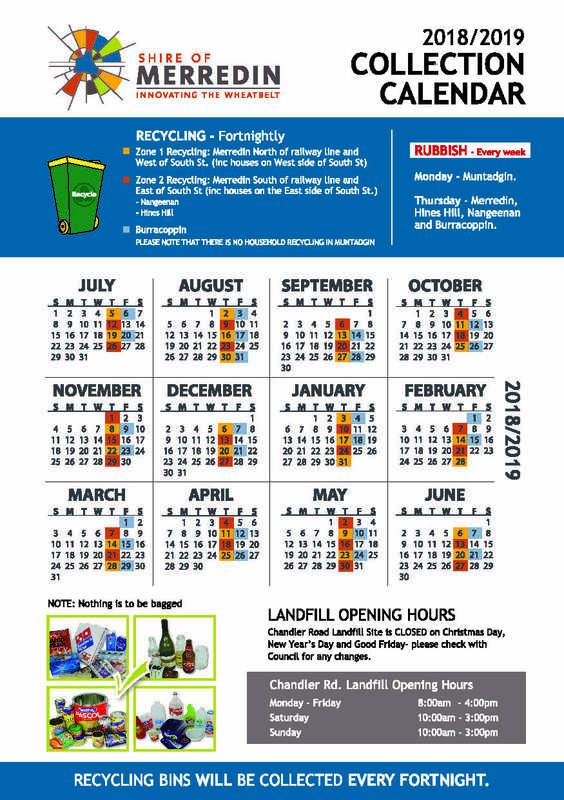 The Shire of Merredin has introduced kerbside recycling for residences within the townsites of Merredin, Nangeenan, Hines Hill and Burracoppin. The service comprises a 240L green & yellow lidded bin serviced fortnightly. You will receive a copy of your Collection Calendar annually with your Rates Notice. Alternatively you can download a PDF copy of the Collection Calendar here. There are 3 collection points in Merredin where you can dispose of your old mobile phone for recycling. Alternatively you can pick-up a free reply paid recycling satchel at Australia Post (Barrack Street) to post back one mobile with a battery and charger at a time. This collection is for one bin per household per week. Bins can be provided by the Shire. Bins can also be purchased from Two Dogs Home Hardware (Ph: 9041 1078) or Avon Waste (Ph: 9641 1318). If you wish to arrange for a second bin to be picked up, please contact the Shire on (08) 9041 1611. A waste stransfer station is provided in Muntadgin. Council manages the Merredin Landfill and Resource Recovery Site, located 5km northeast of the Merredin Townsite along Chandler Road. During 2010 the site was upgraded to provide a materials resource recovery facility, extending the site to cater for general putrescible waste for a period of approximately 25 years. 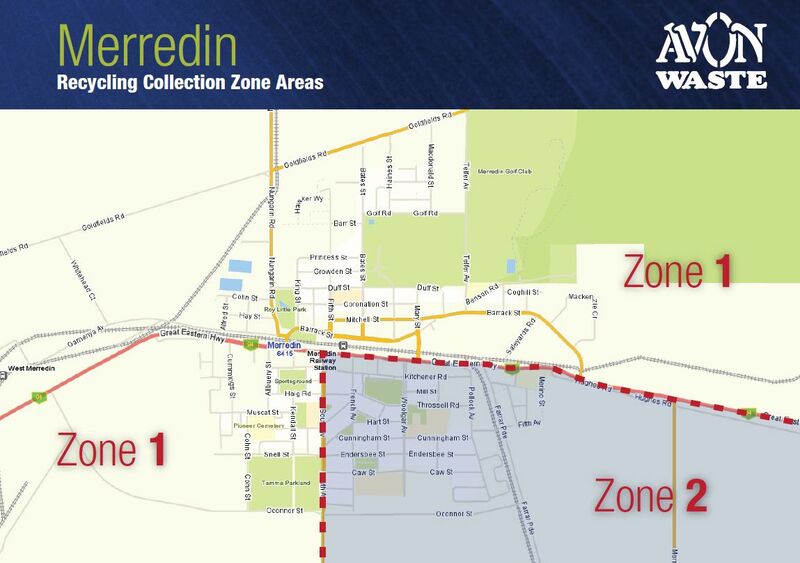 Merredin residents are issued with one tip pass each year which entitles the recipient to unlimited free access to the Chandler Road landfill site, provided that they present their identification tag on entry and that loads are sorted into their designated areas. No tip pass, no free disposal. if your load is unsorted, you will incur the appropriate fee. Commercial users do not have free access and will incur the appropriate fee. The Shire of Merredin does not permit scavenging of the landfill site and issues no salvage rights to any individual. All salvage rights lie with Council and materials salvaged are used to offset the cost of operation of the disposal site. Some items such as bikes, bricks and pallet can be purchased directly at the refuse site. No cash is maintained at the site however Eftpos facilities are available to effect your purchases. Alternatively purchases can be paid for at the Shire Administration Office and goods will be released on production of a receipt. Care should be taken when transporting loads of refuse to the landfill site to ensure that it does not blow off or fall from the vehicle being used. Infringements for littering and unsecure loading can be issued by the Ranger and local Police. Please ensure the load is covered with a tarpaulin or similar and loads are securely tied down with ratchet straps. Proper disposal of products ensures that the cost of operation is minimised and that the life of the site can be substantially extended. The failure to properly dispose will incur a cost to the user. Disposal Fees: Disposal Fees apply for all items which are not recyclable. Fees are set annually and are contained within Council's Annual Budget (see "News and Public Documents" section of this website). Tyres of any kind are not accepted at the site. Asbestos: Disposal of asbestos product is to be carried out in strict accordance with the requirements of Worksafe and the Department of Environment Regulation. Detailed procedures are available from the Administration Office. Disposal of asbestos product will only be permitted if the above requirements are met, appropriate disposal fees have been paid and the asbestos product is wrapped in 2um builders plastic. Green Waste: Green waste, lawn clippings and tree loppings are accepted to the site at no charge when the product is placed in the assigned area. Steel Waste / Car Bodies / Light Gauge Metal: Steel waste and the like is accepted at no charge providing the product can be recycled and is placed in the correct area. Tyres: Tyres of any sort WILL NOT be received at the landfill site. Transport of Rubbish: Care should be taken when transporting loads of refuse to the waste site to ensure it does not blow off or fall from the vehicle being used. Remember that littering is an offence that attracts severe penalties. Waste Oil: Waste oil disposal facilities are located at the Muntadgin Waste Transfer Station and at the Merredin Landfill and Resource Recovery Site. Disposal fees apply as the State Government invoice the local authority for its collection. Members of the public should not put any of the above in the excavated pit. Old tanks, fencing wire and metals of all types can be recycled and may be disposed of at the recycling point. 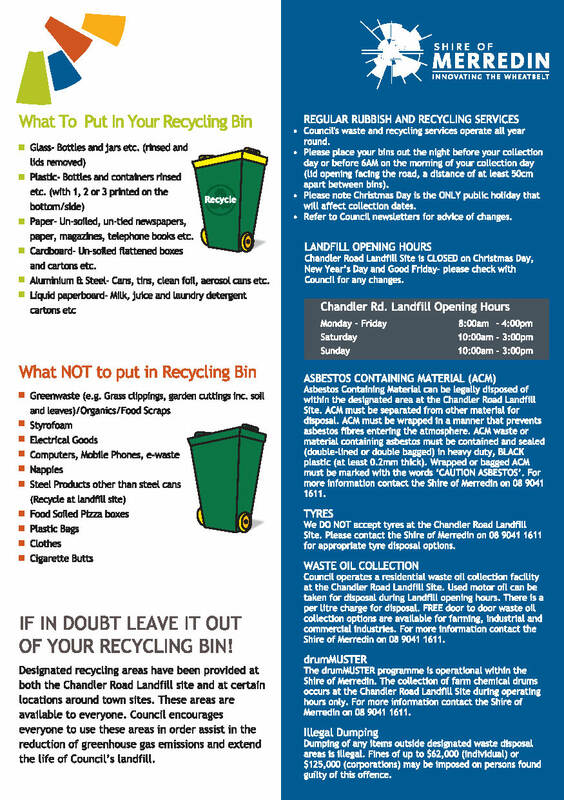 If in doubt please see our Landfill Tip Attendants or contact Shire Administration on 9041 1611.